Despite losing their goalkeeper due to an injury in the game, national soccer girls champions St.John's Kaloleni fought hard to register a win in their opener as East Africa School Games got underway in Eldoret. 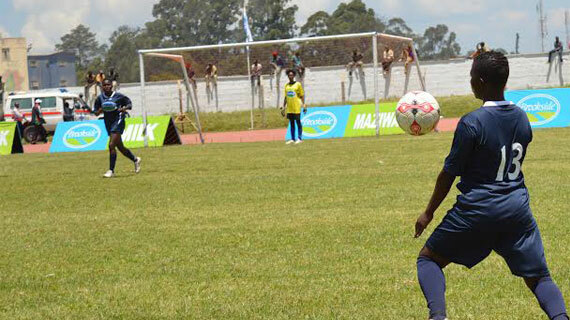 The Kenyan school games soccer queens beat GS Remera of Rwanda 2-1 in an entertaining encounter at Kipchoge Keino Stadium on Sunday afternoon. Barely 7 minutes into the match, Hellen Achieng of Kaloleni drew first blood after smartly challenging Remera's keeper Shamimu Nyinawamuntu with her solid long shot. In the 38th minute, just two minutes into the second half Mwanahalima Adama doubled for her side.In the 61st minute, Remera's captain Caliste Iradukunda got a golden opportunity netting her team's consolation goal. However Kaloleni's goalkeeper Margaret Nzaro was carried off following an injury 27 minutes into the second half with Jeanine Njoroge replacing her in goal. Speaking after the match , Kaloleni coach Joseph Oyoo praised her side but was disappointed and concerned about the state of the injury on his team's regular custodian "The girls tried despite most of the match being rough. we are planning for our next match ,'Oyoo said. Kaloleni will face Alliance of Tanzania on Tuesday .